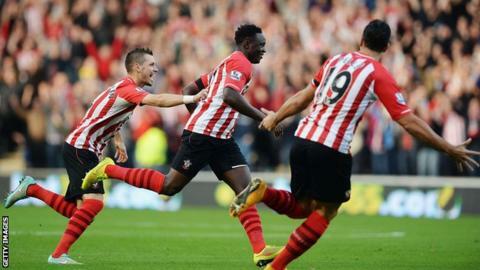 Victor Wanyama's superb chip was enough to extend Southampton's stunning start to the Premier League season and keep the pressure on leaders Chelsea. The Kenyan midfielder capitalised on a poor clearance from third-choice Hull keeper Eldin Jakupovic after only three minutes. Victory was Saints' seventh in eight league games and kept Chelsea's lead at the top to four points. Hull, meanwhile, slipped to 13th, three points above the relegation zone. Southampton are five points clear of third-placed Manchester City, who face Manchester United at Etihad Stadium on Sunday. Jakupovic made a nightmare start to his home debut when his hurried clearance found Wanyama, who clipped a delightful 40-yard chip over the keeper and into an empty net in the third minute. When they had finished celebrating the goal, the Southampton fans launched into a chant of "We're going to win the league". Hatem Ben Arfa and the lively Robbie Brady went close for Hull before the nervous Jakupovic, a Switzerland international, dithered over a through ball and was fortunate to see ex-Tiger Shane Long's header loop over him and bounce wide. In a second half of few chances, Southampton were once again the dominant force. Steven Davis was denied at close range by Jakupovic, while substitute Sadio Mane, from three yards out, could not convert Dusan Tadic's cross. In stoppage time, Graziano Pelle, side-footed wide from almost the same spot, but it mattered little as Southampton secured victory and a fifth clean sheet in six matches. Hull manager Steve Bruce: "If we're going to be honest, the longer it went the worse we became. "We huffed and puffed and nothing came of it. It's a terrific finish but it was a horrible mistake by us. To hit it first time was great on their behalf but awful for us. "He's (Hull goalkeeper Jakupovic) has done so well, waited patiently for his chance and after that (the goal) pulled off some good saves. "Southampton have got a superb work rate and they defend from the front. They have a terrific attitude about them. You have to say 'well played' to them. You have to give the new manager a pat on the back. It's no fluke." Southampton manager Ronald Koeman: "It was a fantastic goal, incredible. He played an amazing game today. "The team has incredible spirit and very good ambition. That makes it an easy job. "We had a lot of changes (in the summer) but we brought good players in and they are adapting very fast. I am proud of that because that means a lot for the coach." Match ends, Hull City 0, Southampton 1. Second Half ends, Hull City 0, Southampton 1. Attempt missed. Steven Davis (Southampton) right footed shot from outside the box is too high. Assisted by Graziano Pellè. Attempt missed. Andrew Robertson (Hull City) left footed shot from outside the box is too high. Assisted by Ahmed Elmohamady with a cross. Corner, Hull City. Conceded by Nathaniel Clyne. Mohamed Diamé (Hull City) is shown the yellow card. Attempt missed. Graziano Pellè (Southampton) right footed shot from the centre of the box is close, but misses to the right. Assisted by Sadio Mané with a cross. Attempt missed. Stephen Quinn (Hull City) header from the left side of the box is high and wide to the left. Assisted by Tom Huddlestone with a cross following a corner. Corner, Hull City. Conceded by Jose Fonte. Attempt missed. Abel Hernández (Hull City) right footed shot from outside the box misses to the right. Assisted by Andrew Robertson with a cross. Substitution, Hull City. Stephen Quinn replaces Robbie Brady. Morgan Schneiderlin (Southampton) wins a free kick in the defensive half. Foul by Mohamed Diamé (Hull City). Foul by Victor Wanyama (Southampton). Ahmed Elmohamady (Hull City) wins a free kick in the attacking half. Substitution, Southampton. Jack Cork replaces Dusan Tadic. Foul by Dusan Tadic (Southampton). Mohamed Diamé (Hull City) wins a free kick on the right wing. Corner, Hull City. Conceded by Dusan Tadic. Sadio Mané (Southampton) wins a free kick in the defensive half. Foul by Ahmed Elmohamady (Hull City). Substitution, Hull City. Andrew Robertson replaces Hatem Ben Arfa. Attempt blocked. Mohamed Diamé (Hull City) left footed shot from outside the box is blocked. Assisted by Abel Hernández. Attempt missed. Sadio Mané (Southampton) left footed shot from very close range is just a bit too high. Assisted by Dusan Tadic with a cross. Delay in match Dusan Tadic (Southampton) because of an injury. Sone Aluko (Hull City) wins a free kick in the defensive half. Substitution, Hull City. Sone Aluko replaces Paul McShane. Substitution, Southampton. Sadio Mané replaces Shane Long. Attempt blocked. Robbie Brady (Hull City) right footed shot from outside the box is blocked. Assisted by Jake Livermore. Corner, Southampton. Conceded by Eldin Jakupovic. Attempt saved. Steven Davis (Southampton) right footed shot from very close range is saved in the top centre of the goal. Assisted by Graziano Pellè. Attempt blocked. Graziano Pellè (Southampton) right footed shot from the centre of the box is blocked. Assisted by Dusan Tadic. Corner, Southampton. Conceded by Ahmed Elmohamady. Attempt blocked. Morgan Schneiderlin (Southampton) right footed shot from the centre of the box is blocked. Assisted by Steven Davis with a cross. Corner, Southampton. Conceded by Mohamed Diamé. Attempt missed. Shane Long (Southampton) right footed shot from outside the box is high and wide to the right. Assisted by Dusan Tadic. Offside, Southampton. Steven Davis tries a through ball, but Shane Long is caught offside.